The World’s Largest Bourbon Festival, Bourbon & Beyond, will make its anticipated return to Louisville, KY Friday, September 20, Saturday, September 21, and Sunday, September 22, expanding to three days full of incredible music, unique culinary events, and unmatched experiences from the region’s best distilleries at the new Highland Festival Grounds At KY Expo Center. Music performers include a unique mix of rock, roots, bluegrass and folk acts headlined by Foo Fighters, Robert Plant And The Sensational Space Shifters (returning after originally being scheduled to appear in 2018) and the Zac Brown Band. 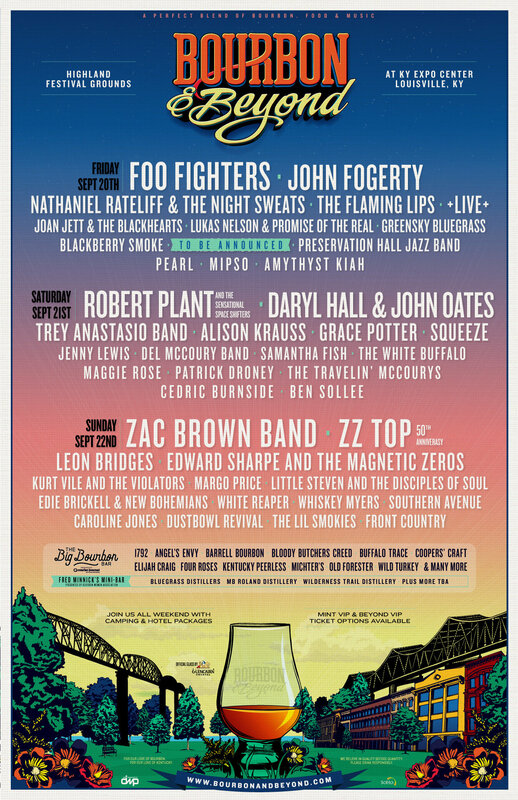 Additional acts include John Fogerty, Daryl Hall & John Oates, ZZ Top (celebrating their 50th anniversary in 2019), Nathaniel Rateliff & The Night Sweats, Trey Anastasio Band, Leon Bridges, The Flaming Lips, Alison Krauss, Edward Sharpe And The Magnetic Zeroes, +LIVE+, Grace Potter, Little Steven & The Disciples Of Soul, and Joan Jett & The Blackhearts, among many others.